London-based design practice, Giles Miller Studio, says it specializes in innovative surface, interior and retail design projects that marry architecture with interior finish "by way of original and inspiring surface development." The studio created the entrance to the London Clerkenwell Design Week creative conference earlier this week, in the form of a timber archway made up of 20,000 angled wooden pixels (see slides). The archway sits inside the original concrete arches of a 150 year old warehouse that has become the hub of the Clerkenwell Design Week. 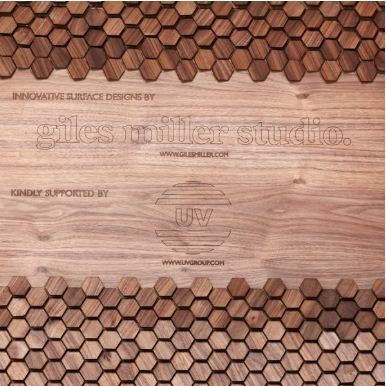 Having worked on projects that span furniture, interior and product design Giles Miller Studio has done work for major brand retailers across multiple industries. The Cerkenwell Design Week project credits The UV Group for wood materials. UV Group is a vertically integrated supplier of timber products, drawn from sustainable logs, frequently FSC certified. Production includes the manufacture of sawn lumber, biofuels, sliced veneers, rotary veneers, spliced veneers, edgebanding, veneered boards, furniture components and quality custom furniture. furniture components and quality custom furniture.